Nearly as amazing as Toothless himself (:P), this is a gorgeous deep purple/blue jelly polish loaded with blue and purple iridescent glitters and shimmers. Shown here is three coats with one layer of top coat. 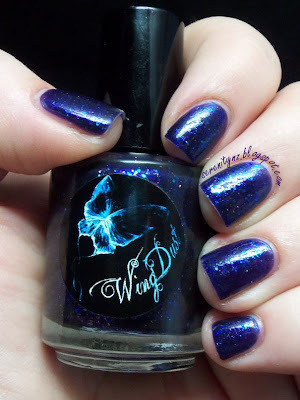 This was my first polish from Wing Dust and I was really impressed with the formula - it glided on really smoothly, not thick at all, and wore really well. I love they way it appeared to almost glow in certain lights. I will definitely be checking out what else they've got, I know they've released a few new polishes recently that looked interesting. I definitely recommend getting hold of this polish if you're a fan of this type of shade! I picked this up at Llarowe but Wing Dust Collections also has an etsy store. 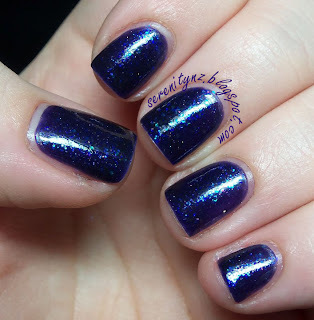 I love Toothless and I love this polish!!! Lovely swatch. I'm so excited for How to Train Your Dragon 2! Aww sorry! I get nail art envy when I read yours :P I wish I could have totoros on my nails!